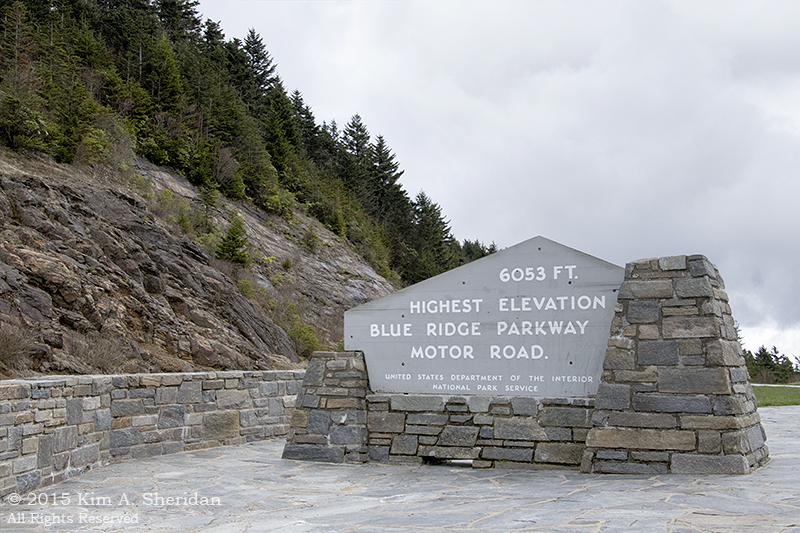 The Blue Ridge Parkway, which stretches through the Blue Ridge Mountains in Virginia and North Carolina, was conceived in the 1930s as a scenic highway that would connect Great Smoky Mountains and Shenandoah National Parks. Our Appalachian odyssey was leaving the Smokies and passing through Shenandoah on our way home. 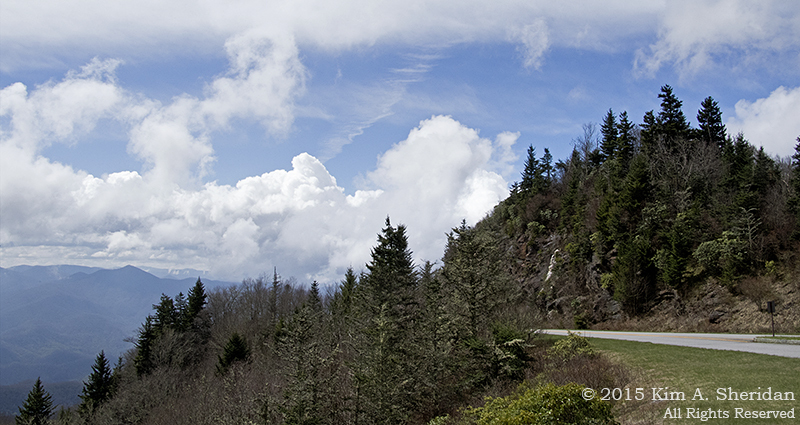 Hey, why not take a few days, avoid the highways, and drive home on the Blue Ridge Parkway? Like many of our plans, this one went awry from the start. I thought I had planned it well, with short drives the first two days, where there was the most to see. The second two days would be longer drives, ending in Shenandoah. Hotel reservations were made along the route, thus assuring Don and me of a nice place to rest for the next day’s travels. I didn’t count on a few things, though. Like detours that forced us off the Parkway in three places. Or the rain that prevented us from actually seeing anything one day. 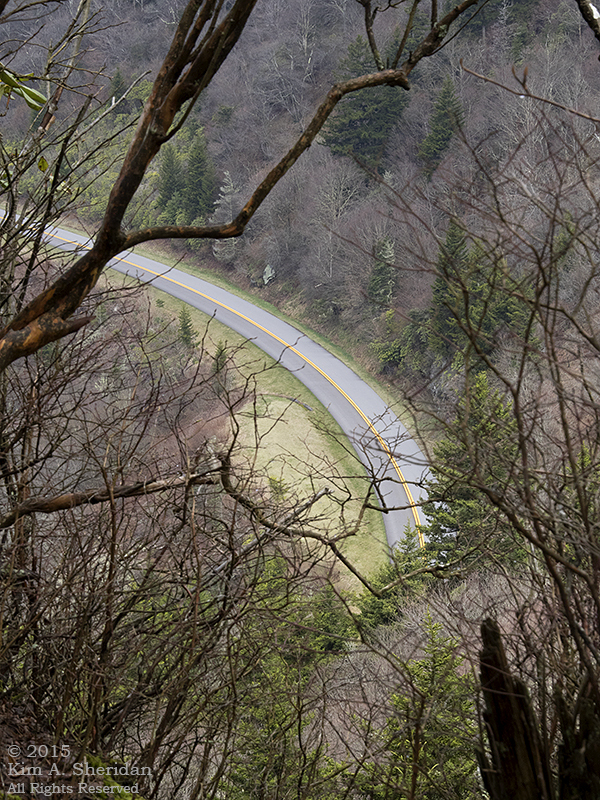 In the end, we drove 282 miles of the Parkway, about 60% of its 469 mile length. Those convenient hotel reservations meant we had deadlines to meet each night, and we lacked the flexibility to fit our trip to the Parkway, and the weather. Clearly it would have been better not to plan, for once. 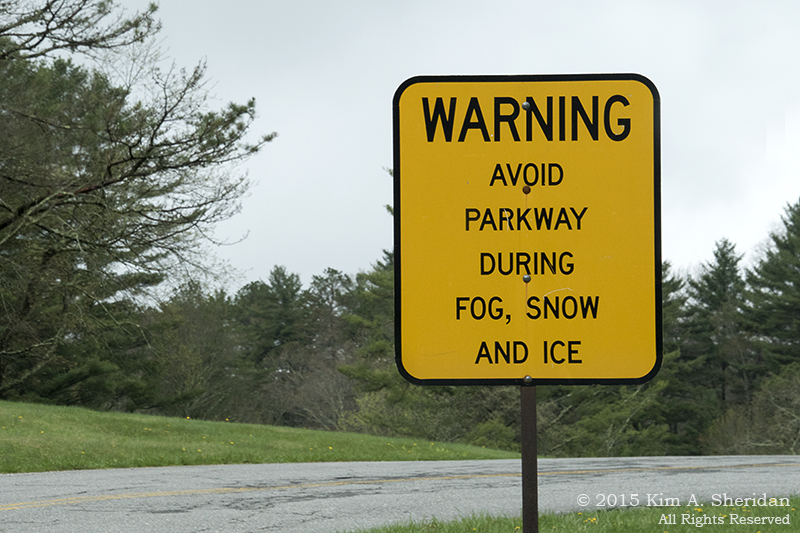 The first day, which turned out nice after the fog cleared, was spent driving through the highest peaks on the Parkway. 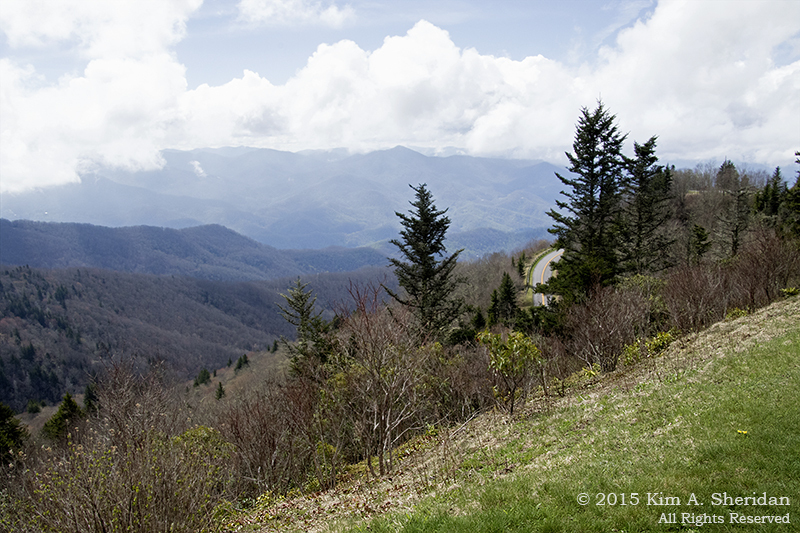 We stopped at every overlook to marvel at the endless lines of mountains marching off into the distance. After awhile it all began to look the same. Waterrock Knob, elevation 6400’ at Milepost 451, stood out with its panoramic views and some interesting rock formations. We declined to make the short walk to the top here. 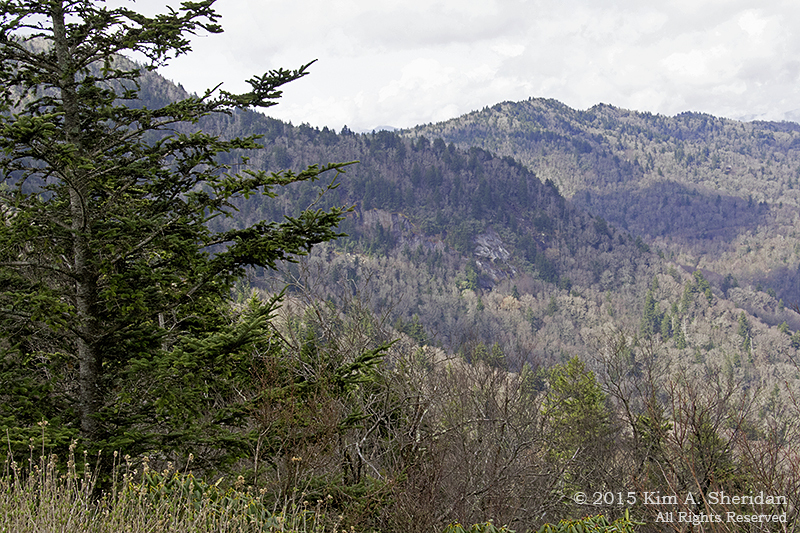 Our legs were still worn out from climbing Andrews Bald and Clingman’s Dome the day before! Instead we enjoyed looking down on the Parkway winding far below us. 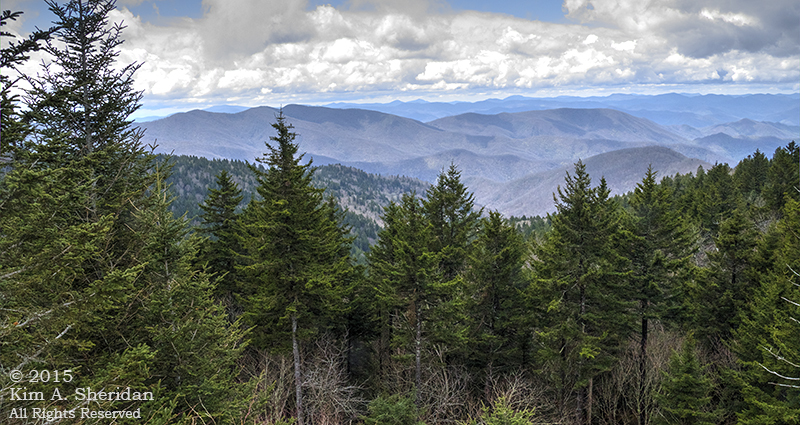 The highest point on the Blue Ridge Parkway is the Richland Balsam Overlook at 6053’, Milepost 431. The views are pretty nice! After Richland Balsam, I was looking forward to Graveyard Fields, Looking Glass Rock and lunch at the Mt. Pisgah Inn. Not this time! A closure on the Parkway at Milepost 423 forced us into a long twisty side trip on some mountain road, and by the time we’d reached an intersection, it was too late in the day to drive all the way back to the Parkway. Instead, we continued on to Asheville, NC, for the night. The weather on Day 3 was much better. The morning fog was picturesque for once instead of obscuring the view. 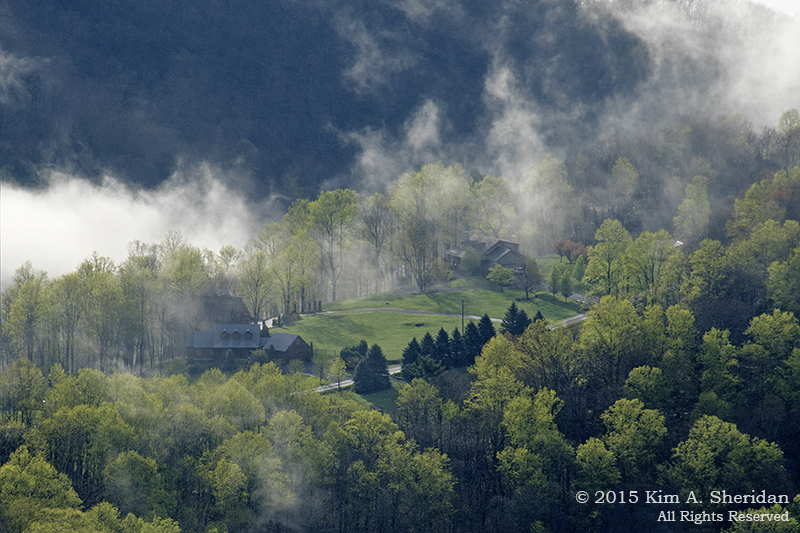 This is the agricultural heart of the Blue Ridge Mountains, and the road overlooked a patchwork of farms and fields. The clouds on our entire trip tended towards the dramatic – when we could see them at all. This was one of the better days for cloud formations. Because he expressed an interest, I bought Don a book on weather in the Asheville Visitor’s Center. I thought maybe he’d like to learn the names of the clouds. Nope. To this day he still calls cumulus formations “fluffy white clouds.” There’s no educating some people. Oh, great. NOW you tell us! At Milepost 216.9, we crossed into Virginia. 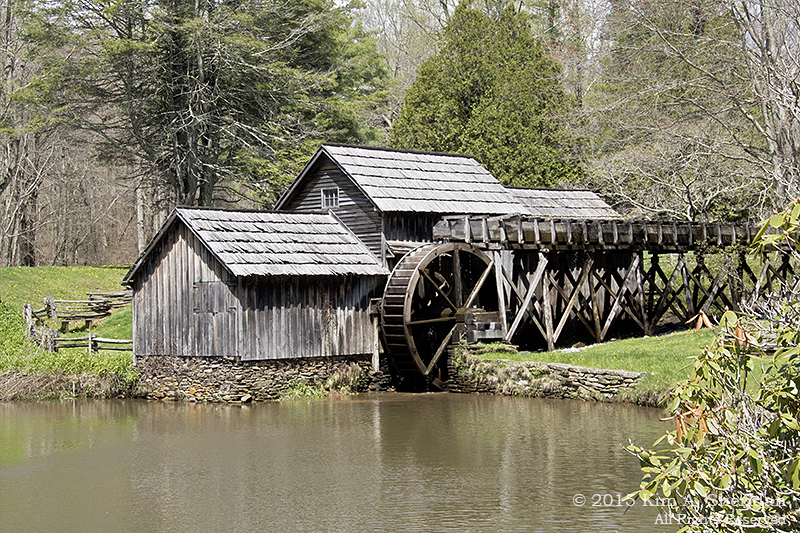 Mabry Mill, at Milepost 176, is one of the highlights of the Parkway. The mill was in operation from around 1910 to the mid-1930s, when the Parkway was being planned. Now it serves as an exhibit of rural life. 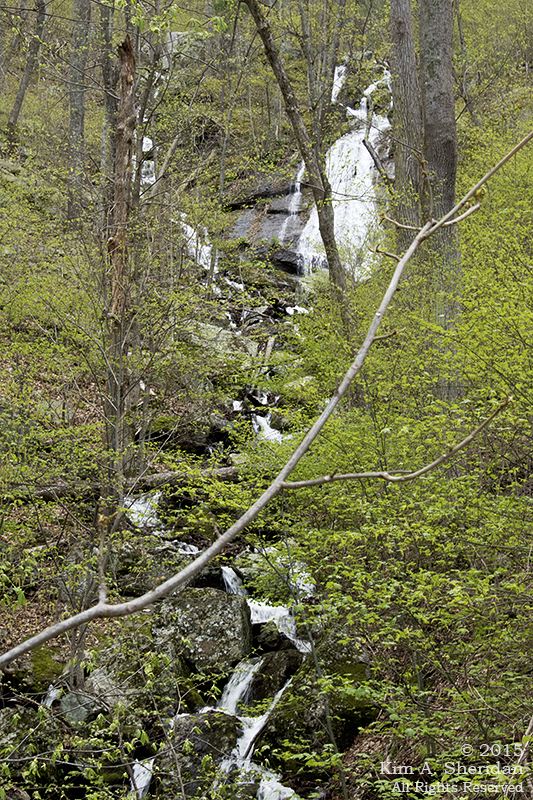 The mill itself is the most photographed place on the entire Parkway, particularly for catching reflections of the mill in fall foliage or spring flowering trees. 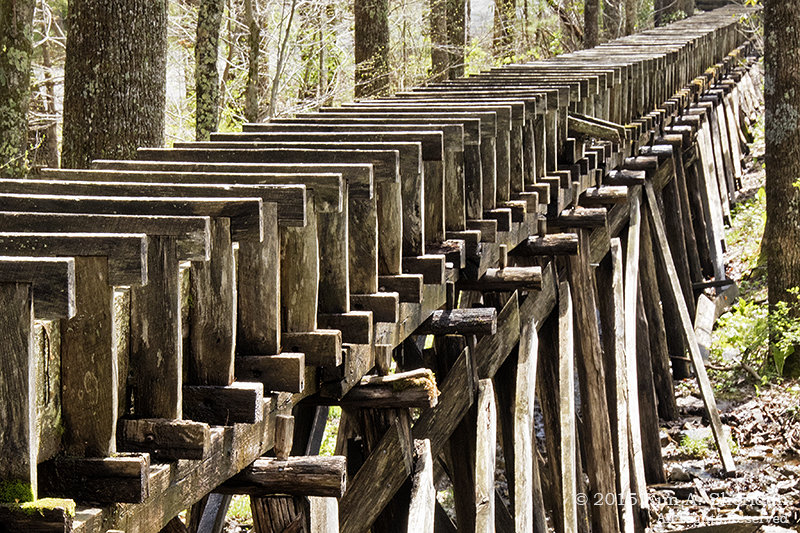 Since the trees were still bare and the water muddy, I found the mill race more interesting. Our last stop on the Blue Ridge Parkway before our night in Roanoke was the Metz Run waterfall along the roadway at Milepost 128. It was also our last stop along the Parkway. 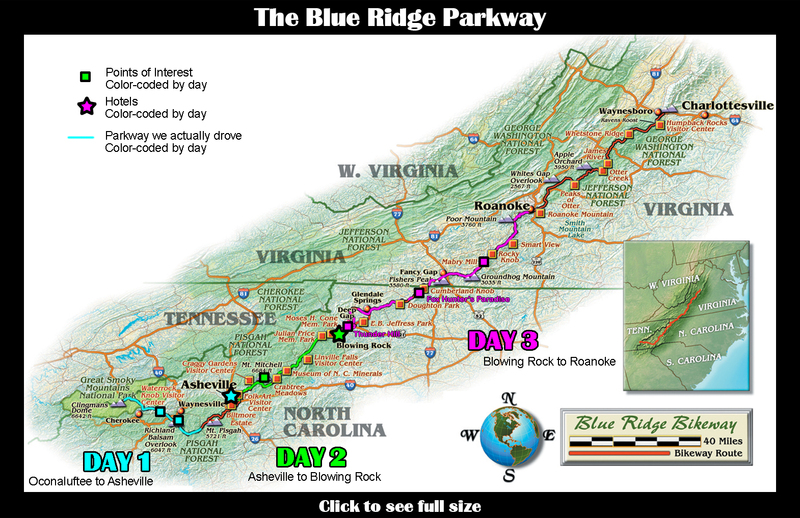 As hard as it was to leave the Blue Ridge Parkway, we opted to skip the last 121 miles. 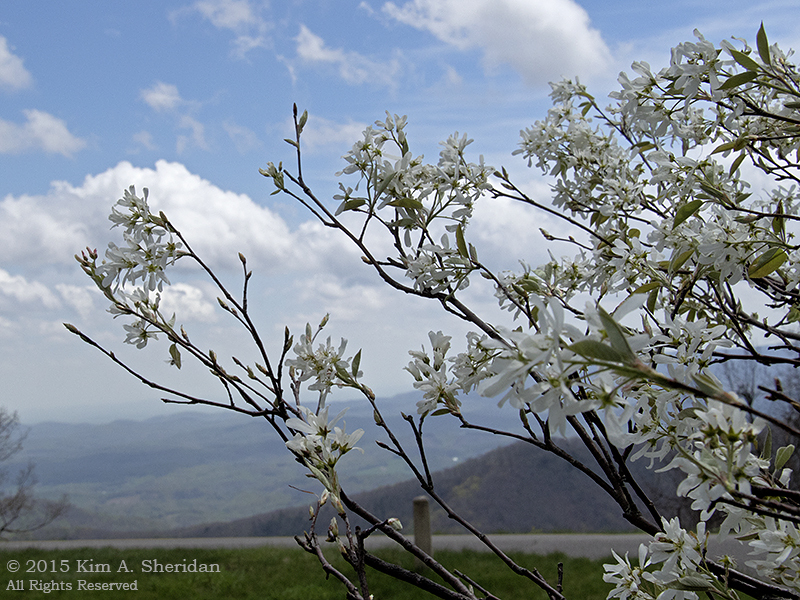 Our new plan was to drive the entire length of Skyline Drive in Shenandoah National Park over the following two days. A quick trip north on the highways took us to Rockfish Gap, where the last chapter of our Appalachian odyssey awaited us. 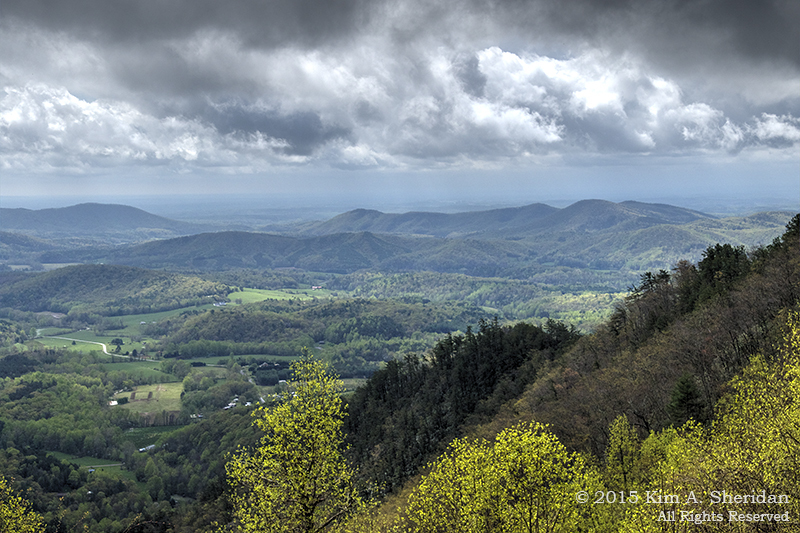 This entry was posted in Appalachian Mountains, Nature and tagged Blue Ridge Mountains, Blue Ridge Parkway, Nature by Kim. Bookmark the permalink.